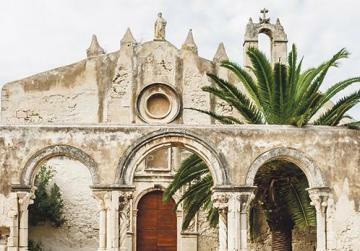 Away from the hustle and bustle of the market, Melisande Aquilina takes in the plentiful cultural sites in Syracuse, Sicily. The Greek Theatre at the Archaeological Park of the Neapolis. 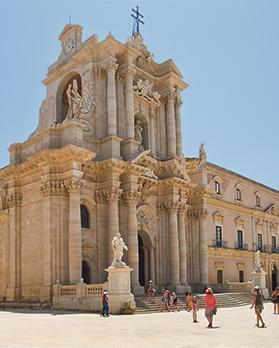 Syracuse is definitely a must-see when one visits the eastern part of the island of Sicily. Not only because of the shopping-complexes, night clubs, or even markets (of which there are many). Rather than the obvious things, I personally wanted to visit Syracuse in order to experience its great cultural and historical wealth. My first destination was the Archaeological Park of the Neapolis. 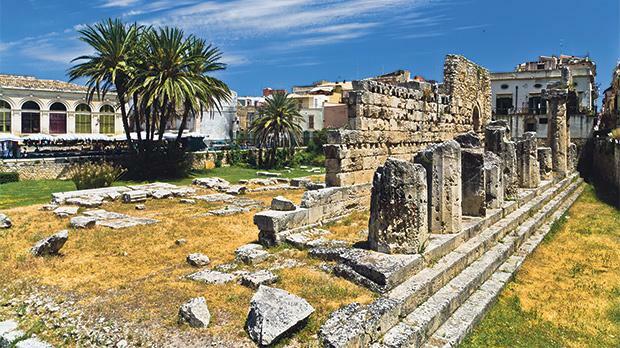 This area is filled with a number of monuments be­longing to different historical time-periods, like the amazing Greek theatre, built originally in the fifth century BC. 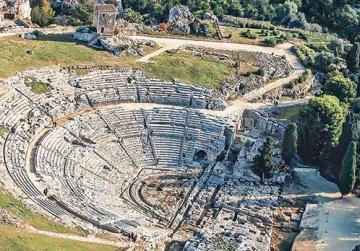 This theatre is strikingly enormous and picturesque and is today a Unesco World Heritage Site. 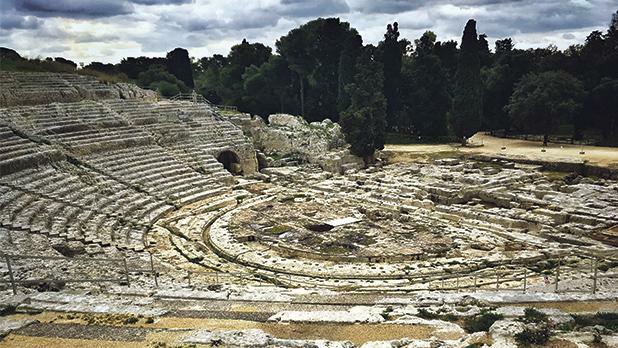 It was one of the largest theatres in the Greek world, and originally contained 67 rows of seating, mostly cut into the living rock, and divided into nine sectors by access stairs. Actual theatrical performances still take place here each year, taking advantage of the great panorama and breathtaking acoustics. These usually take place in the late spring, so since I visited in December, attending was only a dream. Still, climbing all over the attractive monument was totally worth the visit. To the east of the theatre, there is the so-called Latomia del Paradiso (The Paradise Quarry), which used to really be a quarry, but which today is an evergreen park filled with lush Mediterranean vegetation and beautiful natural rock formations. The most famous of these is surely the Ear of Dionysus; a 23-metre-high cave so called due to its shape as well as the great acoustics. As I entered the dark grotto, I was impressed by its height as well as its graceful form. The cave itself is quite shallow, extending only 65 metres back into the cliff-side. I tried yodelling and singing in there and, even though I’m no opera singer, the reverberations of sound still impressed me. Next up, I explored the second-century Roman theatre, which though overgrown with vegetation, is still something to see. As I walked around the ancient rock-hewn monument, I could just imagine sweaty gladiators fighting to the rousing cheers of the crowd. A word of advice – the ticket to the park, which comprises all its archaeological wonders – can be purchased not from the main entrance, but after one traverses a meandering narrow alley chock-full of vendors and tourist rip-offs. Make sure not to use the facilities here, not only because they are not free, but mostly because cleaner facilities are actually available just inside the park, free of charge. The ticket office itself is situated in a tacky and very dirty room hidden behind all these stalls. I had a GPS and still couldn’t find it, and if one asks the sellers at the stalls they try to pressure you into buying something before replying. Not even an American movie director with a penchant for theatrics could have created such a stereotypical Sicilian formula. Moving on; after exploring the park, we went to the eerie and gothic Catacombs of San Giovanni. These Christian underground catacombs can only be visited as part of a guided tour. A guide is always available to give tours both in English and Italian, and a new tour leaves approximately every half-hour. You can peruse the small museum next to the reception area while you wait. While meandering around the subterranean catacombs, which had contained remains belonging to more than 2,000 Christians, I was sorry to see that we had only traversed some of the main corridors and chambers. A tour of them all, I guess, would have been too long, especially as the catacombs are so big, and 45 minutes were just not enough. Faded frescoes and paintings are still discernible on the walls and ceiling. The catacombs themselves are found in a space that was previously an aqueduct carved by the Romans out of solid limestone rock. Later on, they were even used as a bomb shelter during World War II, so I’d say they have quite a rich history, not to mention having served in a versatile number of ways. We were part of a small group and, although I have visited many catacombs and crypts before, it was still a memorable experience. Unfortunately, we could not take any photos while inside the catacombs themselves; however I still managed to lag a little behind the group and take a couple of clicks while we were in the underground chapel at the end. The underground chapel itself was accessed from the ruins of a Norman church situated above-ground. This is the Church of St John, which was built in the sixth century to mark the tomb of St Marcian, the first bishop of Syracuse, who was interred in the cata­combs below. St Paul himself is said to have visited in AD61. Following our trip into the underworld, we emerged into the bright sunlight of Syracuse. It was a chilly December day, but still the sun warmed and brightened our mood considerably. We decided to take our car and drive to the small touristic island of Ortygia, which is actually the historical centre of Syracuse. I admit, it is only a 30-minute walk to the island, but parking was less of a problem than we had originally thought, so we decided to chance it. In fact, there are a number of paid parking spaces all around Syracuse. 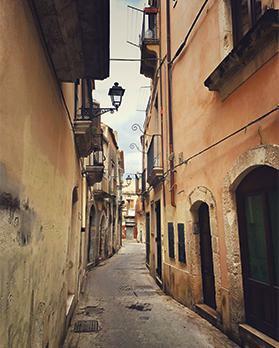 We had planned on visiting the city’s Jewish quarter in Ortygia, the Guidecca, particularly the Mikveh, or ritual baths, which are the oldest in Europe, and date back to the Byzantine period. Unfortunately, we were unaware that most places of interest in what was once the Jewish quarter were only open for visitors in the morning. The time at this point was three in the afternoon, so everything was closed. Still, we enjoyed walking around the narrow cobbled alleys and looking at the graceful houses and churches. We also couldn’t fail but admire the Baroque architectural gem that is the Duomo of Syracuse, that is, the main cathedral. This was originally constructed in the seventh century, however the site itself previously contained a great Greek temple dedicated to the goddess Athena, built in the fifth century BC. Afterwards, it was also very nice to stop for a break at a nearby cafe and relax with some hot chocolate and biscuits directly in front of the mythological Fountain of Diana, built 110 years ago. All in all, it was an exceptional day, however I would definitely recommend anyone wanting to visit the Jewish quarter to go there in the morning, and go to the park in the afternoon, even though, unfortunately, this closes at 4.30pm. Beware of the weather though, as the park, I imagine, would be less enjoyable in rain or snow. Also, wear sturdy walking shoes!